The Airspeed AS.51 Horsa was a British World War II troop-carrying glider built by Airspeed Limited and subcontractors and used for air assault by British and Allied armed forces. It was named after Horsa, the legendary 5th-century conqueror of southern Britain. With up to 30 troop seats, the Horsa was much bigger than the 13-troop American Waco CG-4A (known as the Hadrian by the British), and the 8-troop General Aircraft Hotspur glider which was intended for training duties only. Instead of troops, the AS 51 could carry a jeep or a 6 pounder anti tank gun. The Horsa was first used operationally on the night of 19/20 November 1942 in the unsuccessful attack on the German Heavy Water Plant at Rjukan in Norway (Operation Freshman). The two Horsa gliders, each carrying 15 sappers, and one of the Halifax tug aircraft, crashed in Norway due to bad weather. All 23 survivors from the glider crashes were executed on the orders of Hitler, in a flagrant breach of the Geneva Convention which protects POWs from summary execution. The aircraft was subsequently used during the invasion of Sicily, the Normandy invasion, in Southern France, during operation Market Garden and in the crossings of the Rhine. Post war, the type was evaluated by several nations, but the day of the troop carrying glider was over and all extant examples were scrapped or converted to other uses. On 5 June 2004, as part of the 60th anniversary commemoration of D-Day, Prince Charles unveiled a replica Horsa on the site of the first landing at Pegasus Bridge, and talked with Jim Wallwork, the first pilot to land the aircraft on French soil during D-Day. Ten replicas were built for use in the 1977 film A Bridge Too Far, mainly for static display and set-dressing, although one Horsa was modified to make a brief "hop" towed behind a Dakota at Deelen, the Netherlands. During the production, seven of the replicas were damaged in a wind storm; the contingent were repaired in time for use in the film. Five of the Horsa "film models" were destroyed during filming with the survivors sold as a lot to John Hawke, aircraft collector in the UK. Another mock-up for close-up work came into the possession of the Ridgeway Military & Aviation Research Group and is stored at Welford, Berkshire. 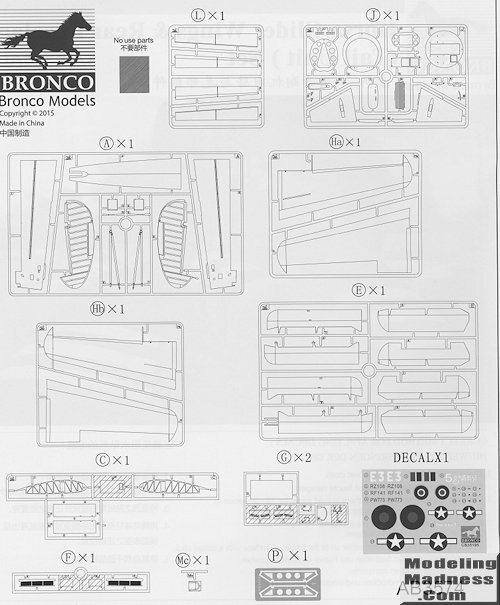 Bronco has done the full glider in another kit and this is basically a boxing that includes just the wings and the rear fuselage/tail section. 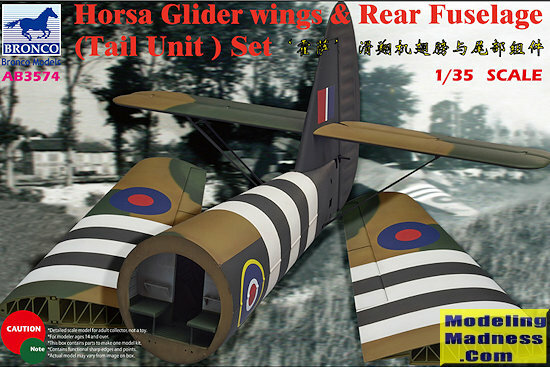 To be honest, I cannot think of many aircraft modelers who would want an incomplete airframe, but then, this kit is obviously aimed at the armor modeler who would want bits of the glider to use as part of a diorama. This would be perfect for a D-Day or Market Garden diorama, or any other operation where the Horsa was used. Despite being an incomplete airframe, the kit fills the box. The rear fuselage section is complete wiht all the various bulkheads and there is stringer detail on the inside of this section. The two small photo etch parts are for brackets that fit on either side of the opening that leads into the rest of the tail section. Elevators and rudder are separate items and designed to move. Wings have separate ailerons though these are shown modeled in the neutral position. The speed brakes and the flaps, however, can be modeled deployed. 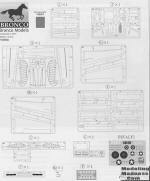 With but six construction steps, this kit is quite different from Bronco's armor offerings in that it looks like it won't take a long time to build. There are no really small parts and the instructions have large, easy to follow steps. 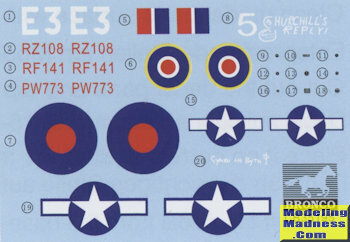 The kit uses the same decal sheet of the full aircraft and provide markings for three subjects. These differ by serial number, with two of them being British and one an American aircraft. All of them are shown with the white Overlord stripes in place. These stripes will need to be painted on and photos of the actual aircraft show that, for the most part, they were applied in a hasty and rather sloppy manner. The large decal sheet is nicely printed and should work as well as any aftermarket sheet. Those who like to do WWII dioramas will find this to be a very useful kit as it is easy to see it being used in many mid-late war European projects. Aircraft modelers will want to go for the full aircraft.